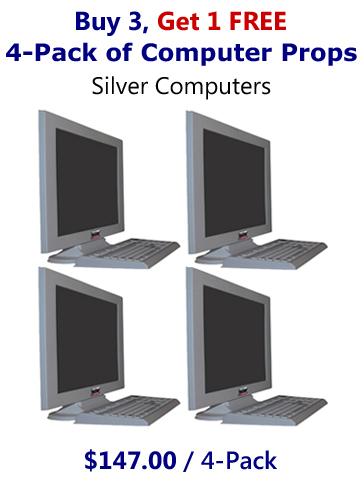 Pack of 4 computer props - includes (4) 22" faux computer prop monitors and (4) faux keyboards in matte silver. Off position screens come standard unless alternative screen savers or screen images are selected. Stock computer screen savers and images are available click here to view options. Have your website on the computer monitor screens. To have a webpage added to the screen of the computer props, please select Screen Image #999 and provide the complete URL address. A proof will be sent to you for your approval prior to shipping. Fake computer monitors are constructed of durable plastic and in a matte finish. The matte finish hides dust and finger prints and is more resistant to scratching. The fake keyboards included are made of molded plastic. The keyboards and keys are 3-dimensional. The individual keys are stationary and non-removable. Props America fake computer props are for display purposes only and have NO working components. Computer props are not designed to be used as toys for children. Props America fake computer props are perfect computer props for home staging, Realtors, home builders, apartment models, and furniture retailers to decorate, inform and show the usage of space. All Props America fake computer props are made in the USA out of molded plastic. Props America dummy computers are ultra-light, inexpensive to ship, and easy to store/move. Props America computer props will not fade or warp over time like cardboard computer props. Our computer props with the off position screen can be used indoors or outdoors and are moisture resistant.